Last year I entered a contest: Recipe to Riches Toronto… One of my favourite female celebrities Laura Calder was there! So, what did the judges have to say about my Lamb & Beetroot Tagine with Honey, Preserved Lemon, Clementine & Pomegranate? That is was delicious, original and looked like art on a plate! Lamb shank (2-3 inch cubes) 2 lbs. Beetroots (2 inch cubes) 1 lb. San Marzano-style canned tomatoes 16 oz. Ras-el-Hanout spice mix 2 tsp. Garlic cloves, minced 1 tbsp. Fresh ginger, minced 1 tbsp. Heat a large heavy bottomed Dutch oven on medium heat. Add salt and pepper to the lamb. Pour in the oil and brown the lamb shanks all over, about 5 minutes. Some of the fat from the lamb shank will also render out (that’s the good stuff!). Remove the shanks onto a plate and keep warm. Add in the diced onion, carrots, celery, red pepper and jalapeno. Sauté till the vegetables start to turn a light golden brown (about 5 minutes). Add in the ginger and garlic and let it sauté for about a minute (it should become fragrant, not turn much colour). Sprinkle in the Ras-el-Hanout and let the spices heat up for 30 seconds to aromatize them. Crush tomatoes with your hands into little pieces. Add the lamb shanks and beets, pour over the beef stock and San Marzano tomatoes. Sprinkle in the saffron. Bring to a boil, reduce heat to a simmer and, cover with a tight fitting lid and cook until tender (about 1.5-2.5 hours depending on the meat). Skim the surface every now and then. Make sure to check on it from time to time, turning the lamb shanks. If the lamb is too dry, add a bit of water. Check for seasoning. The tagine gravy should be thick but loose. Once the lamb is tender, stir in the preserved lemon, Clementine zest and cilantro. The tagine can be served immediately over couscous, or the next day as the flavour improves the longer it keeps. Sprinkle pomegranate seeds just before serving. 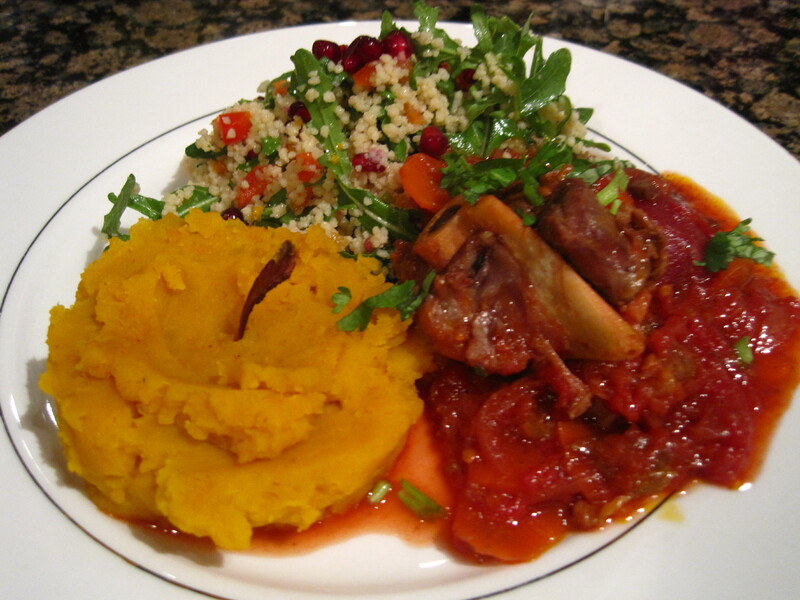 I served mine with pureed sweet potatoes and a cous-cous salad.